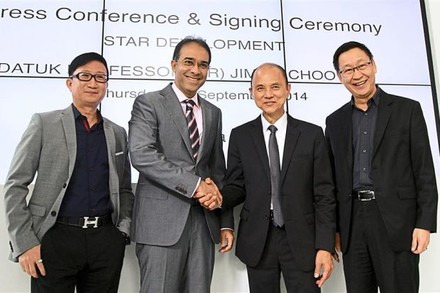 Designer Jimmy Choo recently signed on as endorser and ambassador for Star Development, an upscale, mixed-use project in Kuala Lumpur City Centre. The Malaysian fashion designer has been picked by the developer Alpine Return Sdn Bhd to attract other international and high profile buyers to invest in the 1.62-hectare property. “I am excited to experience the chic lifestyle at Star Development and can hardly wait for it to make its presence felt as an international landmark” Choo said. Alan Koh, chief operating officer at Alpine Return, said that Jimmy Choo embodies the superior quality of Star Residences. “It all fell into place quite naturally as he came by to view the property model and I extended the invitation and Jimmy obliged,” he told local media. Located five minutes away from the KLCC/Ampang Part LRT station, Star Development comprises two main components: Star Residences, with one 57-storey and two 58-storey towers, and Star Boulevard, which features five blocks with a total of 12,077 sqm net leasable spaces, including the Signature Retail dining and entertainment hubs, and Malaysia’s Star Walk of Fame. Construction of the development would begin in November and is slated for completion in 2019. Phase 1 of Star Residences has also achieved more than 80 percent take up rate to date. Choo marked the occasion by being the first international celebrity to be inducted into the Star Walk of Fame with an imprint of his hands. A recent study showed that designer homes in Kuala Lumpur are likely to get an average of 35.7 percent uplift in prices than non-branded properties. A flat in London for just £2,000 down?